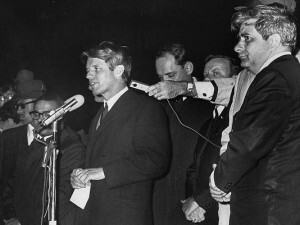 Robert Kennedy speaks to a crowd in Indianapolis after the King assassination in 1968. Surveys tell us Trump has hit a nerve. Across the political spectrum Republicans, Democrats, independents agree that “political correctness” is a big problem even if, as I suspect, most Americans would have trouble defining the term. Political correctness is the problem for all seasons, an all purpose explanation for any position that someone else holds that you find disagreeable. As with most things he says Trump has misdiagnosed “the big problem.” And the misdiagnosis is glaringly apparent in the roiling wake of post-July 4th America. America’s diverse culture – a nation of immigrants – with class, racial, educational and wealth disparities doesn’t really suffer from an over abundance of political correctness, but rather the illness is a deficit of essential civility and engaged citizenship. Our challenge, as the distinguished scholar Danielle Allen says, is reflect on our own history to find how diverse individuals live together in a shared public life. To put a fine point on it: way too many Americans are ignorant of how their government really works and woefully deficient in understanding the country’s history and how that history informs and effects what is happening today. It is nothing less than a national crisis. It is insane. And if you think about it O’Connor’s point helps explain a lot about the current state of American democracy. When Trump says he is going to “build a wall” and a foreign country will pay for it or when Bernie Sanders promises health care for all, a well-informed, civically-aware American says, “hold on. How you goin’ do that?” The informed voter might well ask: What is the role of Congress in getting that done? Can you bring along the other side? What will it cost? Do you know even what you are talking about? Politicians have always made grand and unrealistic promises, but voters should be well enough grounded in civic reality to reel in the truth and discount the blarney. Hard to do if you don’t have the basic understanding of how government works. Translation: May sound good, cannot happen. To reach the goal of eliminating the national debt in eight years, Trump would need to slash all federal spending by two-thirds. No serious person believes that could either happen or should happen. The economy would tank and the political and economic dislocation would be enormous. But to make those judgments requires a working knowledge of government and how budget and fiscal decisions are made. An engaged citizen doesn’t need Hank Paulson’s experience, but they do need to know more than Donald Trump does. Far too many don’t. The other foundational piece to a better informed and engaged citizenry represents, not surprisingly perhaps, the antithesis of what the GOP nominee has been offering for months. 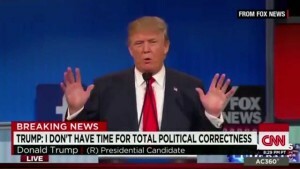 When Trump fumes against “political correctness” what he is really rejecting is what my mother would have called “civility.” Or simply being nice, respectful, courteous. Making an attempt to understand the other person’s perspective. Insulting women, repeatedly referring to a United States senator as Pocahontas, constantly referring to your opponents as “liars” or “crooks” or “low energy” is not politically incorrect it is rude, vulgar and beneath the playground taunts of a junior high school bully let alone a presidential candidate. Imagine – I hope you can only imagine – such language at your dinner table or work place. Few would tolerate it simply because its wrong, hateful and mean. Who can really argue that these are the characteristics we should encourage or value in our leaders. An essential responsibility of leadership, whether in the corporate boardroom or the Oval Office is to educate, explain, to empathize and illuminate rather than divide, degrade and preach a politics of despair and hatred. In a brilliant and also shocking piece of political reporting, the New York Times Nick Confessore honed in on the connections between citizenship and civility and how Trump, in the name of disowning political correctness, has broken something that will be hard to mend. “In the months since Mr. Trump began his campaign, the percentage of Americans who say race relations are worsening has increased, reaching nearly half in an April poll by CBS News. The sharpest rise was among Republicans: Sixty percent said race relations were getting worse,” Confessore writes. Trace that increase directly to the Republican nominee. And Confessore continues: “And Mr. Trump’s rise is shifting the country’s racial discourse just as the millennial generation comes fully of age, more and more distant from the horrors of the Holocaust, or the government-sanctioned racism of Jim Crow.” This is the intersection between coarseness and lack of civility and the American citizenship deficit. President Obama tried to remind us this week what America should be about, what it could be about. In a moment of profound national distress the nation’s first non-white president appealed to our better angels. He was, of course, immediately criticized and critics continue to offer the fiction that the president is “anti-police,” still Obama’s words demand our attention, demand that we reflect, not merely react. “In the end, it’s not about finding policies that work,” Obama said. “It’s about forging consensus and fighting cynicism and finding the will to make change. “Can we do this? Can we find the character, as Americans, to open our hearts to each other? Can we see in each other a common humanity and a shared dignity, and recognize how our different experiences have shaped us? And it doesn’t make anybody perfectly good or perfectly bad, it just makes us human. I don’t know. I confess that sometimes I, too, experience doubt. I’ve been to too many of these things. I’ve seen too many families go through this. That open heart begins with genuine civility and new commitment by each of us to real engaged and informed citizenship. I’ve spent the last two weeks on a 3,000 mile road trip through nine very rural western and southwestern states – flyover country for Hillary, Jeb and the cast of thousands seeking a nomination, any nomination, for president. All the candidates who seek our attention now and our votes next year, will say they lust for the White House in order to “give voice to” and “represent” the “real folks” in rural America. They all talk about flyover country like they’ve been there. 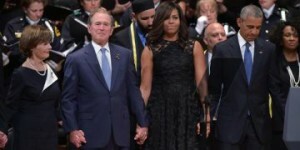 Truth be told none of them have really spent any time in the American outback and if they were to visit – don’t hold your breath – they would be as out of place as sport coat at a rodeo. The rural American west is where you see motels named Shady Rest and where every town seems to have an Outlaw Saloon and an El Rancho Steakhouse. The main streets are wide and mostly quiet, particularly since Walmart came to town. The chain stores that helped doom the mom and pop stores in rural America tend to cluster at the far edges of the old pioneer towns along the highways where you slow down to 30 miles per hour so that you have time to count the pick-ups at the Taco Bell. Occasionally you can still find a reminder of what good tastes like at places like Sehnert’s Bakery and Bieroc Café in McCook, Nebraska. We had to ask what a bieroc was, but the locals know. You can’t get a bieroc at the Taco Bell, by the way. More often the storefronts are covered with plywood, the drug stores are empty and convenience stores double as a place to buy groceries. Lots of things have disappeared in flyover country, including most of the movie theaters. I love Netflix and Hulu, but there is no substitute for the group dynamic of going to a movie in a real theater. A favorite uncle long ago owned The Harney Theater in Custer, South Dakota. It was a magical place for a kid where cutouts of snowy white clouds – made of plywood, I suppose – were suspended from a robin’s egg blue ceiling. It was a place for dreaming. For the admission price of a quarter I fell in love with Doris Day at the Harney and marveled at the exploits of Henry Fonda and Richard Burton in The Longest Day. I held hands with a girl for the first time in that dark, slightly musty movie palace. Talk about magic. Today the Harney is a pizza parlor and seeing that made me feel like I had just said goodbye to one more piece of my youth. On Interstate 80 west of Green River, Wyoming and literally in the middle of nowhere sits Little America. Once upon a time calling Little America a “truck stop” was a little like calling John Wayne a “thespian.” Little America was our regular lunch stop on the road to Salt Lake City years ago and when we stopped recently – I remembered the booths, the soft serve ice cream and the waitresses who called everyone “honey” – the nice woman behind the counter said the “sit down and be waited on” restaurant had closed last fall. Lunch options in Little America now included the kind of fare you find at a convenience store connected to gas pumps. A slice of rural America really did turn out to be just a truck stop. Change can be tough on memories. My road trip was an attempt to connect again with some places I knew forty (or more years ago) and to jog old memories of events, people and places that, whether we fully know it or not, shaped our understanding of the world. After the trip my memories of life in rural America seem better than today’s reality. I once lived in Rock Springs, Wyoming, for example (quit laughing) and realized that my (almost) life-long fascination with trains can be traced back to that old railroad and coal mining town that is literally divided in half by the Union Pacific mainline. At the zenith of American train travel in the 1940’s one hundred trains a day passed through Rock Springs and fully a quarter of that number were passenger trains. By the time I came to live in southwestern Wyoming the passenger train era was rapidly coming to a close, but as a romantic eighth grader already enamored by travel I still remember walking down to the old Rock Springs depot to wait for the arrival of the Portland Rose, one of the Union Pacific’s most impressive trains. The Rose operated right up until the Amtrak era. I was never disappointed with the arrival of the sleek yellow coaches trimmed in red and gray. I wanted, of course, to get on board, settle in my Pullman and think about dinner in the diner complete with “many Pacific Northwest products.” Sadly that is only a memory. Once upon a time you could get a train to almost anywhere in rural America. Now you can drive. If you live in Cambridge, Nebraska or Sundance, Wyoming you drive a hundred miles to get on an airplane. Nostalgia aside, and while admitting I love trains, we have made systematic public policy decisions over many decades to lavish massive public subsidies on planes, trucks and automobiles and permitted a once great national passenger rail system wither and die. Deregulating airlines in the 1970’s doomed air service to many small markets and as a result transportation alternatives really don’t exist now in the outback. There are a lot of gas stations, however. The more conservatives candidates for high public office now and next year will appeal to rural Americans by talking about guns and stoking fear of the federal government. Those are time-tested tactics that have worked for a long time and will work again. Most of rural America is painted dark red after all and no candidate is likely to offer a public policy answer to keeping a local restaurant in business in rural Nebraska. You can take to the bank the fact that no one will talk seriously about the poverty, the flight of young people to “urban opportunities” or the persistent economic decline of small town America. No one will recall that once upon a time government programs brought electric lights to farms and precious water to crops and that politicians fought for the honor to speak for small town America. The overheated rhetoric of the coming campaign will merely reinforce the sentiments of the guy in South Dakota I saw, who displayed a big sign saying, “Don’t blame me, I voted for the American.” There is a good deal of anger – maybe even fear – just below the surface in the outback. I’m old enough to remember when Robert Kennedy came to Pine Ridge, South Dakota in 1968, the poorest county and the poorest Indian reservation in the country, in an attempt to place rural and Native American poverty on the presidential agenda. Historian Thurston Clarke has written about Kennedy’s visit and noted that no presidential candidate since has made the trip to Pine Ridge, even though poverty is just as endemic today as it was in 1968 and the suicide rates are tragic to the point of scandal. Rural America’s challenges have been reduced to a political talking point. Conservatives blame the problems on the heavy hand of government and too much regulation and they take rural votes for granted, while liberals have lost elections in rural American for so long they hardly even attempt to relate, which makes what Bobby Kennedy did nearly 50 years ago all the more remarkable. It will be impossible for any serious presidential candidate during the next campaign to avoid talk of the dramatic growth of economic inequality and the shrinking middle class in the United States, but most will do so while headed to a fundraiser in New York City or Silicon Valley. Fly over country, the place that promised opportunity to immigrant Americans a hundred or more years ago, is more familiar than most places with the decline of the middle class. Today the rural west seems a shrinking, weathered place where jobs are as scarce as a first run movie – or any movie – and real solutions for generations of problems are as non-existent as a passenger train or a serious visit from a national candidate. Bad luck like stupid comments seems to come in threes. Ozzie Guillen, the mouth-running, currently suspended manager of the Miami Marlins baseball team is at once the most politically incorrect man in America and the luckiest. He desperately needed to get off the front pages after taking Miami’s re-branded team, cozy in its new stadium, and running his mouth straight into south Florida’s visceral hatred of Fidel Castro. Ozzie says his comments in Spanish praising Fidel lost something in translation, but what Guillen really mangled with his ill-considered comments about the country’s least favorite commie was an old and simple rule. Loud mouth baseball managers really should never comment on anything other than what happens between the lines. Danger lurks out there beyond the friendly confines – remember Marge Schott – where men play the boys game. But thanks to cable television, just as it looked like Ozzie might still pay for his Fidel praising with his job, two other stupid comments make Ozzie seem so last season. Enter Republican Rep. Allen West of Florida – what is it with Florida, anyway – and Democratic political operative and CNN talking head Hilary Rosen. Consider them the duo with the crazy opinions today. Ozzie Guillen must be smiling as he sits out his suspension somewhere. Nothing spikes a stupid political comment like another stupid political comment. In West’s case it was the astounding contention that a majority of the Democratic members of the U.S. House of Representatives – West said 78 to 81 members to be imprecise – are communists or socialists. And Rosen popped off on cable to the effect that Mitt Romney’s obviously smart and appealing wife had never worked a day in her life. The other problem is a growing inability on the part of many in public life to tell one of their friends that they are just flat wrong. This has become a particular problem for politicians. Congressman West made his silly comment – opinion devoid of fact really – at some type of a friendly town hall meeting. The question that prompted his opinion came from the audience and, I’m guessing here, he wanted to play to the crowd so he answered in a way that he thought the crowd would appreciate. Maybe West believes what he said, too, but he was clearly playing to the crowd. He might have simply said in response to a silly question, “That is a silly question” and moved on. Rather he offered the alternative, an ill-considered opinion that helped move Ozzie off the front page. Same with Rosen. She was trying to make the point that the Romney’s aren’t like most Americans who worry about mortgage payments and buying groceries, but she couldn’t stop there. 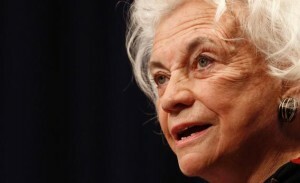 Opinions being the coin of the talking head realm, she couldn’t resist offering a further opinion about Ann Romney. Not having a “real job” would, by the way, be news to any woman who has raised five sons and been a partner to a corporate CEO and a governor. The comment was, well, stupid, but Rosen was behaving the way a partisan TV talking head is expected to behave. She has to have a million of them, opinions that is. So, as author Steve Rushin has pointed out, I am myself dangerously close to failing to practice what I preach against since – hold on – I’m having an opinion. Rushin calls such behavior a sequel to the movie Blowhard, which I confess I have never had the pleasure of seeing. The sequel, however, would be called Blowhard 2 – Blow Harder. I’ll bet Ozzie’s mom told him something similar and he just forgot. And that’s my opinion and I’m sticking with it, while searching for that movie sequel on DVD – Blow Harder. More than 20 years ago I was on the way home from a trip to Washington, D.C. with Clancy Standridge, who was for many years the legislative liaison and a top political confidante of my old boss Idaho Gov. Cecil D. Andrus. It was late, the flight had been a long one, we were a little grumpy and tired from a series of those non-stop and not very productive meetings you often have in the nation’s capitol. As we stumbled up the long concourse in the Salt Lake City airport headed for the connecting flight to Idaho, handsome, debonair Clancy offered up an observation I have found myself repeating ever since. “This time of day,” he said, “your shoes feel like they are on the wrong feet.” Everyone laughed and the ordeal of getting home suddenly didn’t seem so onerous. That was Clancy Standridge. Anyone who was around the Idaho Statehouse during the late 1980’s and early 1990’s will remember white haired, well-tailored Clancy Standridge who died recently in Portland, Oregon at age 84. It is a testament to Standridge’s skill with people and Andrus’s sense about what a Democratic governor had to do to interact successfully with an overwhelmingly Republican legislature that the state’s political watchers still say that Clancy was as good a gubernatorial emissary as has ever prowled the third and fourth floors of the Idaho Statehouse. Clancy did his job the old fashioned way with unfailing courtesy, easy charm, a warm smile, a great sense of humor and by treating the most junior page with the same respect as the Speaker of the House. He also never forgot a commitment or failed to keep his word. Legislative attaches, the hardworking women who make the legislative machinery run, loved him. He handed out candy and compliments and people trusted him. It was remarkable the kind of gossip the old boy would pick up just by listening and being interested. When a junior backbencher just had to see the governor, Clancy made it happen. When a legislator who had consistently voted against everything the governor proposed, but still wanted a picture taken when his pet bill was finally signed into law, Clancy saw to it. Born in Oklahoma on the cusp of the depression decade, Standridge was raised by grandparents, made his way west, served during the Korean War and hooked on with GTE, the old telephone company. He started out climbing poles and eventually worked up (or down) to serve as a senior government relations executive. Andrus plucked him from retirement to serve as his eyes and ears with the legislature. It’s hard to think he could have made a better pick. Clancy was smart, well read, schooled in politics, but more than anything he was a practitioner of the kind of personal style attributed to another Okie, Will Rogers, of whom it was said he never met a man he didn’t like. In politics, of course, you do meet people you don’t like, Clancy just never let on. I never heard him use the word, but Clancy Standridge practiced the art of civility, in fact he wrote the book on how to deal with people in the world of politics. At a time when Barack Obama is criticized, even by those in his own party, for being distant and a loner, when it takes a Camp David-like effort to get two golf loving politicians, the president and House Speaker John Boehner, together to play a round, and when bipartisanship can’t even extend to the dinner table, it’s worth remembering what a little civility can accomplish. Despite the toxic nature of our politics and even in the face of poll tested attack lines the world – including the political world – still works on the basis of personal relationships. Washington waxes nostalgic for the time when Ronald Reagan and Tip O’Neill could make a deal on taxes or when Lyndon Johnson and Everett Dirksen could have a couple of belts followed by a handshake and move the country forward on civil rights. A few more D.C. golf games, a few more cocktails on the Truman balconey and a little more common decency in Washington and in every state capitol wouldn’t hurt any politician and it would be good for the country. The little courtesies, the random acts of kindness work to build trust and respect and even powerful people can be moved. It becomes a little more difficult to call the political opponent an SOB when you’ve had dinner with the SOB and his wife and found out about his kids, his motivations and his needs. Personal relationships grease the wheels of politics or, if common decency and respect don’t exist, the gears seize up more frequently. Does anyone think the country would be worse off if Harry Reid and Mitch McConnell shared a laugh together once in a while? Harry ought to send Mitch’s wife flowers on her birthday. Clancy Standridge would have tried something that simple and that effective. Clancy Standridge knew all about personal relationships. He was one of a kind, but I hope not the last of his kind. Barack Obama got off a wonderful line last week when he spoke to more than 500 of the nation’s tribal leaders at a major conference in Washington. The president recalled his Montana campaign last year and the occasion of his adoption by Hartford and Mary Black Eagle of the Crow Tribe. “Only in America,” Obama said, “could the adoptive son of Crow Indians grow up to become President of the United States.” The quip reportedly got a big laugh and illustrates Obama’s deft touch and graceful sense of humor. The presidential attention may also signal a new day – long overdue – of federal government attention to tribal issues. In 1934, another president – Franklin Roosevelt – on another trip to Montana was honored by the Blackfeet Tribe with a ceremony near Two-Medicine Chalet in Glacier National Park. That’s FDR in the back seat of his Cadillac touring car. He had spent the day touring the park. First Lady Eleanor Roosevelt is standing next to then-Interior Secretary Harold Ickes. In my read of New Deal history, FDR’s policies toward tribal nations were a mixed bag. Roosevelt championed the Wheeler-Howard Act, also known as the Indian Reorganization Act of 1934 or, as then-BIA Commissioner John Collier preferred, the Indian New Deal. Well intentioned as most of Roosevelt’s policy was, it still suffered from a “Washington knows best” bias and even Collier, a generally great Commissioner, possessed a heavy paternalist hand. Obama’s moves so far seem to hold great promise for true progress on tribal issues. Obama’s joke about his adopted status was a light hearted moment during an otherwise substantive meeting; a meeting that was almost completely overshadowed in the news cycle by the tragic shootings at Ft. Hood, Texas. Mark Trahant, an Idaho native from Ft. Hall and a thoughtful commentator on Native American issues, says Obama’s decision to put the Office of Management and Budget (OMB) at the center of coordinating federal policy regarding tribal nations means the president means business. I agree. Any good bureaucrat knows that policy follows the money. Obama’s tone and his appointments – former Idaho Attorney General Larry EchoHawk is the Assistant Secretary for Indian Affairs – together with his empathy and directives to the bureaucracy could truly mark a new era. Let’s hope so.